Nitric oxide concentration in the upper atmosphere is known to be highly dependent on the solar activity. It can be transported to the stratosphere by the atmospheric circulation. In the stratosphere it is responsible for the destruction of ozone and consequently stratospheric heating rates are affected. This is one of the mechanisms by which solar variability has been suspected to drive variability in the energetic budget of the Earth climate. Therefore, it is essential to know every physical and chemical processes leading to the production or to a destruction of nitric oxide. The aim of this work is to calculate the production rate of NO+ and some of the NO electronic states created by electron impact on NO at night in the auroral zone using an electron transport code. We study this variability under different precipitation conditions and taking into account the variability of the neutral atmosphere with the geomagnetic and solar activity. We find that the energetic electron precipitation has a very small effect on the absolute value of the NO+ and NO* production rates. In order to help further research to consider the effect of NO+ and NO*, we provide a table of all the production rates in a medium solar and geomagnetic activity case. 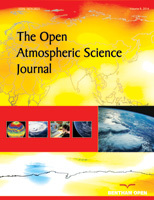 Keywords: Nitric oxide, Thermosphere, Climate, Stratosphere, Solar Variability, Atmosphere. © 2017 Vialatte et al.